Concrete Deicers - Does De-icing Salts Harm Concrete? The Truth! Is it a myth or is it the truth that concrete deicers cause the surface of concrete to scale, spall, and pop off when applied during winter months? Being in the concrete business for 30+ years, I get asked that question a lot. The truth is, concrete deicers don't really harm the concrete, it's what the deicing salts do to the snow and ice that potentially harms the concrete. 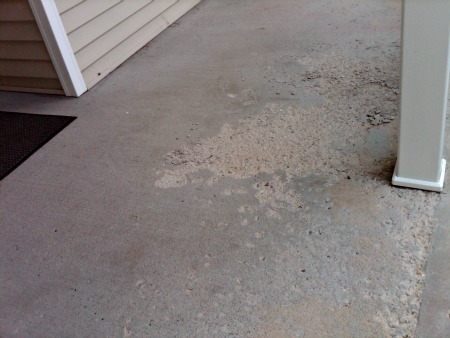 Improperly poured, cured, and sealed concrete is susceptible to freeze and thaw damage. When you put deicing salts on concrete to melt snow and ice, the deicing salts change the snow and ice from a solid to a salty liquid (brine solution) that melts more snow and ice, eventually breaking the bond between the ice and the concrete. If you don't remove the melted (slushy) mixture of snow and ice from the surface of the concrete, this is what can start to cause damage. Concrete is very porous, it will absorb some of the brine solution if it isn't properly sealed. When the deicing agent wears off or the temperature falls below its ability to work, the brine solution re-freezes in the concrete and expands. Good concrete is designed with microscopic air voids in its structure to allow for water to be absorbed, freeze, and expand. Properly pouring, curing, and sealing the concrete are all important parts of the equation. When water, whether its from deicing salts or not, is allowed to continually freeze and thaw inside the concrete's structure it stresses the concrete and can cause its surface to fail. Improperly designed, poured, cured, and sealed concrete doesn't have as good of a natural defense (air-void structure) to allow for the many freeze/thaw cycles that deicing salts put the concrete through in a winter season. It's really the constant thawing and re-freezing of the melted snow and ice inside the concrete, sometimes multiple times a day, that harms the concrete, not the deicing agent itself. Concrete less than 30 days old, even if it's properly designed, poured, cured and sealed, should never have deicing salts spread on it. 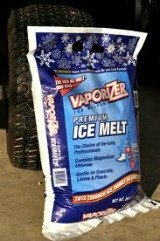 It's recommended by most deicing salt manufactures to not apply their products to concrete that's less than 1 year old. It does take concrete at least 30 days and sometimes up to a year to reach its full strength. Just use some sand in the meantime and clean the concrete off regularly. Some deicing salts for concrete are corrosive, sodium chloride (rock salt), and calcium chloride are two. If your concrete has rebar or wire mesh in it, the liquid brine solution can cause the metal to corrode (rust), metal expands when it rusts, this could also cause the surface to pop or scale. If you're not sure your concrete has rebar or wire in it, then avoid using concrete de-icers with chlorides in them. Concrete deicers are a good way to clear the snow and ice from the surfaces of concrete walks, driveways, patios, and parking lots if they are used properly. All deicers for concrete are rated for temperature, read the label and use the one that will work best for your temperatures. Don't over apply the deicing material and once it breaks the bond between the ice and the concrete, shovel or broom it off the surface. What is the best deicing salt for concrete? What is the best pet safe ice melter?